A dozen leaders of Catalonia’s failed 2017 independence bid have gone on trial in Madrid, facing charges including rebellion and sedition. If convicted, some could face up to 25 years in prison. The semi-autonomous region of Catalonia held an independence referendum on 1 October 2017, and declared its independence from Spain weeks later. But Spanish authorities declared the vote illegal, and the national government imposed direct rule. Nine of the defendants have spent months in pre-trial detention, and arrived at the court on Tuesday morning under guard. The remaining three had been free on bail. The most high-profile of the Catalan leaders on trial is the former Vice-President Oriol Junqueras. His superior – former President of Catalonia Carles Puigdemont – fled abroad and remains in exile. Mr Junqueras faces the longest potential sentence for the alleged crime of rebellion, at 25 years. Others accused of the same charge, including former speaker of the Catalan parliament Carma Forcadell, could receive sentences of 16-17 years. They also face the lesser charge of sedition, as do several former ministers. There is also the accusation of misuse of public funds, in organising a referendum that had been declared illegal by Madrid. But some of the accused, speaking to the BBC ahead of the trial, said the proceedings were political in nature and denied that any violent uprising had taken place, pointing instead to violence committed by police against voters. Outside the court, large crowds gathered with both supporters and opponents of Catalonia’s independence bid present. 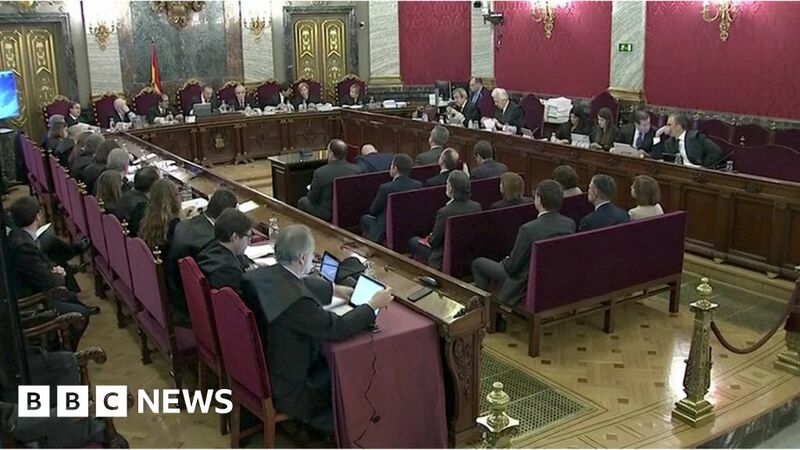 Spain’s El Pais newspaper reported that many were blocked from entering the Supreme Court by police – including, briefly, family members of the accused, until some confusion over who was permitted to enter was cleared. The trial begins almost a year and a half after the failed independence bid – which remains controversial. In Madrid on Sunday, thousands gathered in a pro-unity demonstration against Catalan independence. Yet the separatists retain significant political power. Spain’s Prime Minister Pedro Sánchez needs votes from pro-independence politicians to pass his government’s budget bill through the Spanish parliament. If that bill fails, it could collapse the government and result in a snap election.